Novice Sing, one of our many English students at Big Brother Mouse in Luang Prabang, Laos. “No, we are not allowed to ride the motorcycles or the bicycles either,” he says in hesitant English. 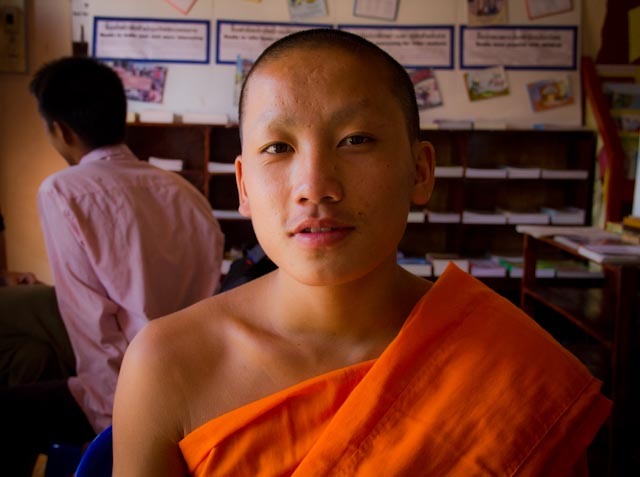 As a monk in training, he and other novices are forbidden to ride either modes of transport. “But we watch television at night sometimes. And I have a phone!” He pulls out a bright purple Nokia that clashes as terribly with his robes as one would think it did with his Buddhist lifestyle. We were teaching English to students in Luang Prabang, a UNESCCO World Heritage Center in northern Laos. We teamed up with an organization called Big Brother Mouse, a local non-profit that found a fun, innovative way to help local kids learn to read in their native language, while also teaching them to speak English. They also provide kids a place to hang out for a few hours and stay out of trouble. Kip, friend Chris, and Novice Sing. 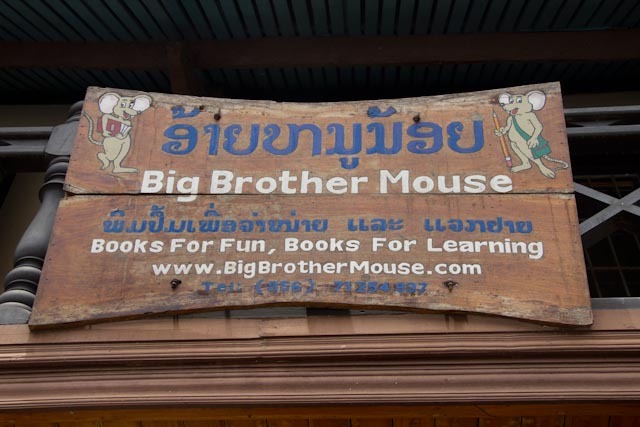 In Luang Prabang, a historic city whose architecture and cultural heritage attract thousands of tourists from around the world, Big Brother Mouse has turned its “office,” a small two-story wooden structure that used to be someone’s house, into a free language learning center for kids. The group invites English speaking visitors like us to drop by any day of the week to sit down and talk with locals who want to learn the language. The main goal of the organization is to improve literacy rates throughout Laos. The organization writes, illustrates and publishes children’s books in Lao language then distributes them, via travelers, to remote parts of the country where books and libraries are rarely found. It’s a brilliant and cost-effective (free) concept that seems to be working well for everyone involved. We had a great time interacting with the students, who ranged from the aforementioned novice monk to rural school children to young college students who hoped to someday work in the tourism industry. A big thanks to our friend Chris, who showed us up by bringing donations for the kids all the way from Oslo! Liz and the sign out front at Big Brother Mouse HQ. 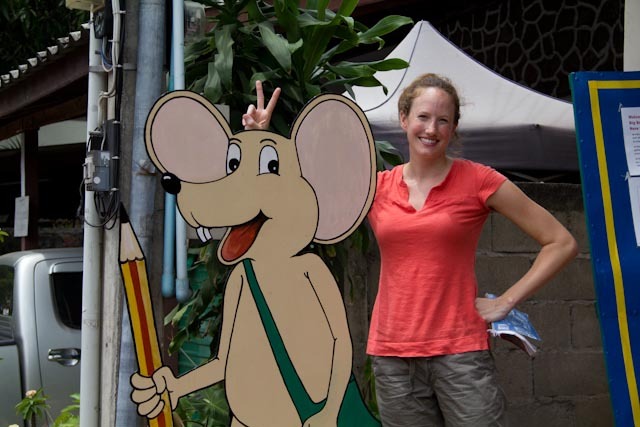 For more information on Big Brother Mouse or to make a donation, visit their website at www.bigbrothermouse.com. From what we’ve seen, they’re doing great work in Laos. Now we’re on our way to deliver Big Brother Mouse books we purchased to school children in the outlying villages near Phonsovan, famous for a collection of mysteriously-massive jars created some 2,000 years ago, as well as for being home to thousands of unexploded ordinance left over from U.S. bombing during the Vietnam War. We’ll have more on that later. Our second day at Big Brother Mouse. No, Liz's hair isn't that blond. Liz is the fourth person on the left. 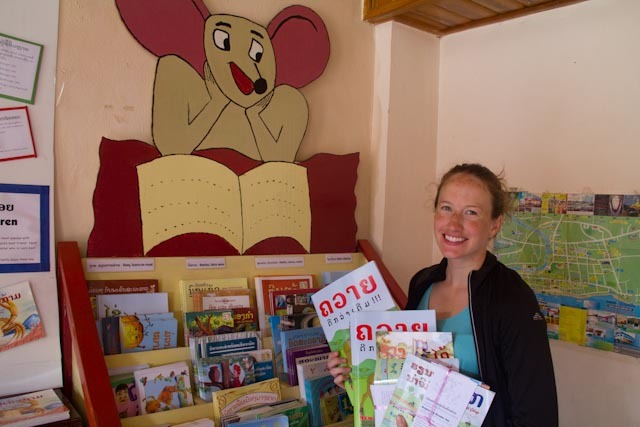 Liz holding a selection of the children's books we're delivering to children near Phonsovan, Laos. 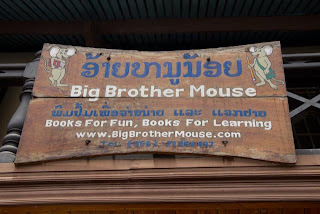 The sign at Big Brother Mouse HQ in Luang Prabang.